Many times I use the Wouxun KG-UV8D for listening to V-U. For this purpose I bought the battery eliminator http://www.ebay.com/itm/Original-Car-Charger-Battery-Adapter-Eliminator-For-Wouxun-KG-UV8D-Walkie-Talkie-/261659307275?hash=item3cec1c2d0b who has the necessary slot at the sides, as the batteries. So I followed the logic of the charger that comes with it, to create a desk stand, and now I can see the LCD screen comfortably! 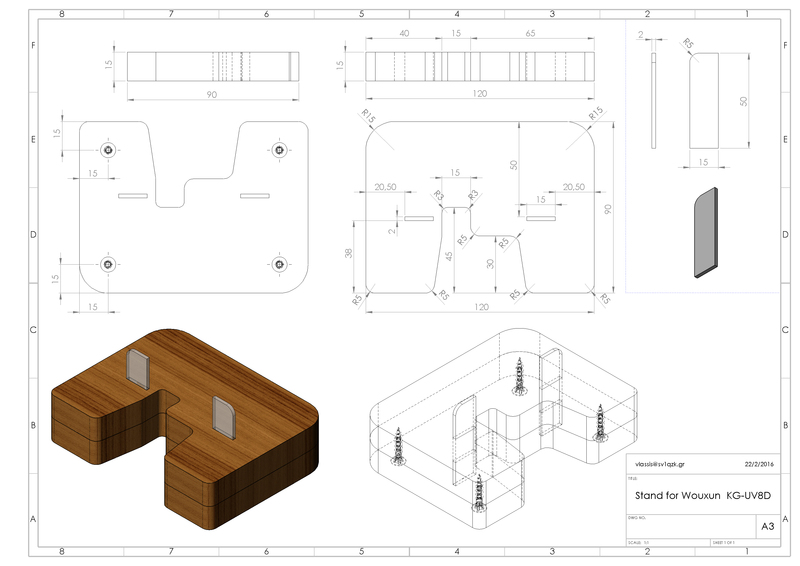 You need only one piece of plywood 240mm x 90mm x 15mm and a piece of plexiglass 50mm x 30mm x 2 mm. For the union of wooden elements use 4 wood screws (as shown in the drawing) and for the plastic elements, glue.